Much of that previous sentence could be rewritten to reflect the turbulent friendship that Victoria experienced with John Brown, her Scottish manservant. That relationship occurred post-Albert and pre-Abdul, but there are remarkable similarities between the two men that would make watching this and Mrs. Brown (1997) something of an exercise in deliberately instilled déjà vu. Suffice it to say, the similarities don’t end there. The active racism of the period is front and centre, as is the general xenophobia of the Queen’s household, but the distaste with which Abdul’s presence is regarded is pushed to the fore on too many occasions for it to remain effective. It’s a given that there’s going to be a resistance from the Establishment over Abdul’s perceived influence, but in the end this is the main focus of the movie and the source of much of the drama, whether it’s Eddie Izzard’s churlish Bertie looking miffed behind his beard, or Tim Pigott-Smith’s equerry, Sir Henry Ponsonby, being rebuffed at every turn in his efforts to undermine Abdul’s position. Efforts are made or attempted to have Abdul removed, Victoria stands firm against these impositions, and then – repeat. This does allow the movie to maintain a certain rhythm, but the repetitive nature of the screenplay (plus the story’s inevitable ending) leaves the movie feeling more and more dramatically redundant as it progresses. But while the material may feel a little fusty, there’s no denying the energy of Stephen Frears’ direction, or the merits of the performances. 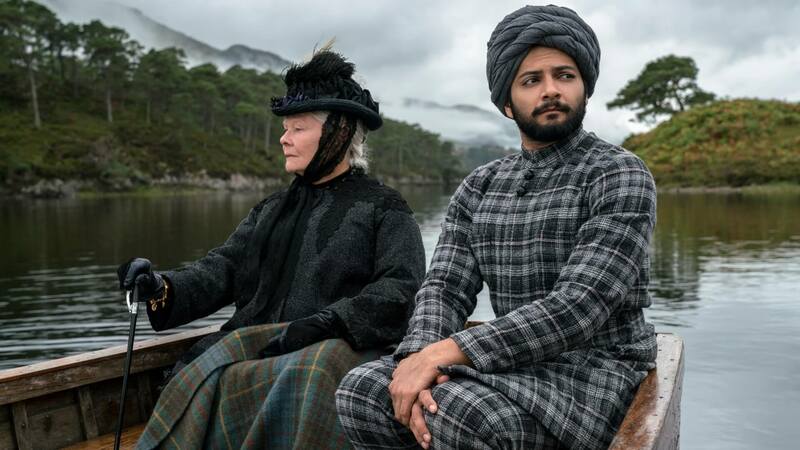 Frears is too experienced to let the predictable nature of the material get in the way of stopping him from making an entertaining and enjoyable movie, and this is the case with Victoria & Abdul. Frears has the confidence to alter the mood of a scene on the turn of a sentence or the change of a look, and he does so on several occasions, and often through observing the characters in repose or in thought. Judi Dench gives another exemplary portrayal of Victoria, and it’s one that reveals several hidden layers to the character, all of which highlight the often lonely and fragile nature of the Queen at that time, while also reinforcing her reputation for being obstinate and direct. As Abdul, Fazal has much less to do, but still makes a good impression in a portrayal that, despite being that of a title character, is effectively a supporting role. The rest of the cast, all seasoned professionals who could carry off this sort of thing in their collective sleep, encourage the familiarity of the period and the material, and it’s all beautifully rendered by DoP Danny Cohen, who is something of an unsung hero in the world of cinematography. 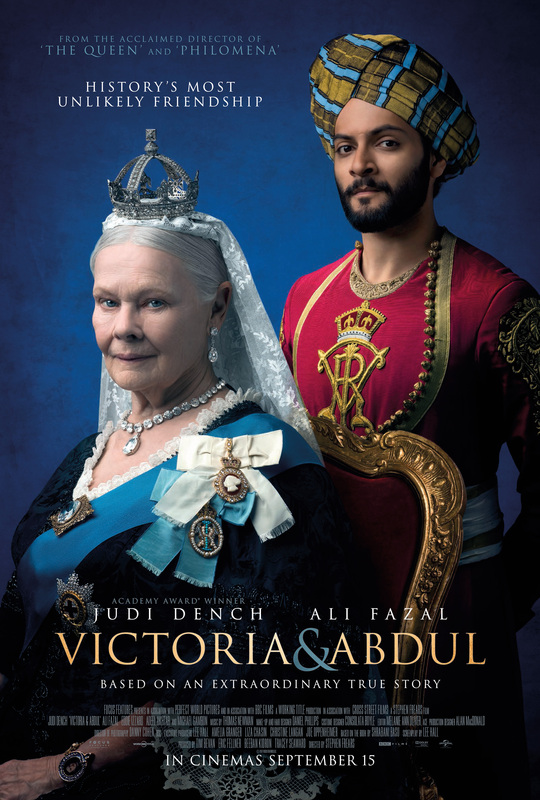 Rating: 7/10 – though put together with enough due care and attention to ensure that watching it is a gratifying experience for the most part, Victoria & Abdul remains a standard piece of history-telling that won’t surprise viewers in any way at all; the cinematic equivalent then of a pair of comfy slippers, this avoids being bland and unremarkable thanks to the talent involved, and because everyone still enjoys seeing the Establishment being thwarted at every turn in its machinations.